After the musical automata of the french mechanics Jacques de Vaucanson and Pierre Jacquet-Droz, in the end of 18th century came the time of the mechanical organ (known as the orchestrion), which was intended to replace automatic organs of the period, with their unchanging tone color and dynamics. A large, complex barrel organ of the flute-clock type, the goal of the orchestrion, was an imitation of an entire orchestra. The pipes were opened by levers, activated by means of pinned cylinders, perforated cards, or similar devices. The first complex orchestrion was made by Johann Strasser in St. Petersburg in 1790s. Who was this remarkable mechanic? Johann Georg Strasser (Straßer) was an Austrian clockmaker and mechanic, born sometime in the middle of 18th century in Baden bei Wien, a small spa town in the vicinity of Vienna. He started his carreer in Viena, but in late 1770s decided to move to Russia. In 1770s and 1780s Russian Empress Catherine the Great continued the long tradition of inviting the best foreign artists, architects, scientists and other cultural figures to work in Russia. Thus in the end of 1770s Johann Strasser was invited and settled in St. Petersburg, where he remained until his death in 1815. Johann Strasser (in Russian: Иоганн Георг Штрассер) established his own mechanical workshop in Petersburg, and served as a member of the German craft council and alderman of the clock workshop. In 1781 he was engaged by Russian Senate as carillonneur and clock technician of the St. Petersburg cathedral. Strasser performed ably for 8 years between 1781 and 1789 and through his successful supervision of 3 students left capable successors to continue his work. Johann Strasser was a remarkable technician. He created a lot of complex music machines, and almost all of them became very popular. His machines featured not only a clever mechanic, but were also very beautiful. By order of the Empress for her favorite grandson (the Empress paid him a huge sum—10000 rubles) in 1792 he devised a giant secretary-clock (now located in the State Hermitage, see the nearby image), with height of about 3 meters, which was is equipped with a mechanical organ playing twelve pieces (Mozart and Haydn). 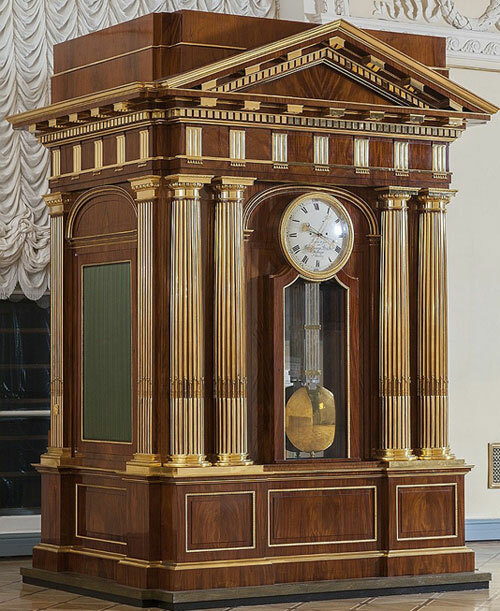 Two more clocks of similar but less complex design, Strasser made for Emperor Paul I in 1798 to be installed in the Mikhailovsky Castle (now at Pavlovsk and in the State Hermitage). The most remarkable work of Strasser (the so-called mechanical orchestra or "Штрассеровы часы"), was built between 1793 and 1801 (now in the State Hermitage, largely in working order). This magnificent machine (see the lower image) is a huge structure in the form of the temple (the height of about four meters) with columns and pediment of mahogany and gilt bronze. In the center is the clock (showing the hours, minutes and astronomical seconds) and a window with a huge pendulum (weight 43.65 kg). In the case of this structure is embedded a musical instrument—a unique mechanical organ that combines the two orchestras that provide the richness and fullness of the sound. The body was set in motion by two large springs and four weights (60 kg each), which must be pre-raised. The device even includes a warning pipe, that sounds when an inexperienced user is in danger of overwinding the mechanism. Unlike smaller, more typical musical clocks of the time, that perform only short pieces, Strasser's orchestrion plays extended movements and whole works, that last over 8 minutes. The music is recorded on removable wooden cylinder (length 127 cm), pinned in a spiral (during playback, the barrel not only turns, but also slides horizontally along its axis), each of which plays music for 8 minutes. Originally were recorded 13 cylinders, most of them pinned by Thomas August, the son of Johann Strasser. The first of these was the overture from Mozart's The Magic Flute, on the other—different fragments of the works of Mozart, Haydn and Viennese pianist and popular composer of his time Anton Eberl, who lived in those years in St. Petersburg and wrote a piece specially commissioned by Strasser. Strasser invested most of his fortune, efforts and time in his giant orchestrion, and after completion in 1801 he estimated it to the huge sum of 60000 rubles. Realizing that this price was impossible to be paid, he decided to organize a lottery, selling 600 100-ruble tickets. He published a booklet, describing his creation (see the booklet of Strasser, digitized by Google, books.google.com). To promote the lottery, Strasser traveled across the country and arranged performances of the orchestrion. The draw was held on May 4 1804, and the owner of the winning ticket turned out to be an elderly widow of a priest in Libau, Latvia, who had been given the ticket by a soldier. Russian Tsar Alexander I paid the widow 20000 rubles and a lifetime pension for the machine. The orchestrion has been in the Hermitage since 1805. The most awe-inspiring feature of the orchestrion of Strasser was neither its imposing stature, nor even its ability to play long pieces, but rather its capacity for subtle nuances and great naturalness in the instrument's performance. In Russia Johann Strasser started a genuine dynasty of masters of mechanical music—his son Thomas August Strasser (Фома Иванович Штрассер), grandsons Johann (Иван Фомич Штрассер) and Alexander (Александр Фомич). Thomas August Strasser (1781-1855) had a workshop and served as a court clock master and technician in St. Petersburg, and also created several orchestrions. He had 4 sons and 5 daughters. His eldest son Johann (1819-1854) and the younger son Alexander (1831-1888) also became very good technicians.